the random oracle - now accepting queries. While some have already proposed a layered approach to the Blockchain,many (but not all) treat the Blockchain as the base layer, which is like building a skyscraper starting at the 30th floor. Focusing on deploying complex applications on top of a Blockchain is, in my opinion, premature, as the DAO hack has demonstrated. 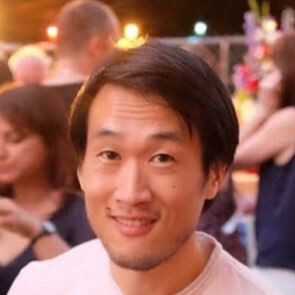 In a forthcoming paper, I will present a simple theoretical proof of security of the Bitcoin Blockchain protocol, whose simplicity is possible because it only requires looking at the consensus layer. I believe that this (or a similar) decomposition into layers will open the door to simple analyses of the higher layers as well. 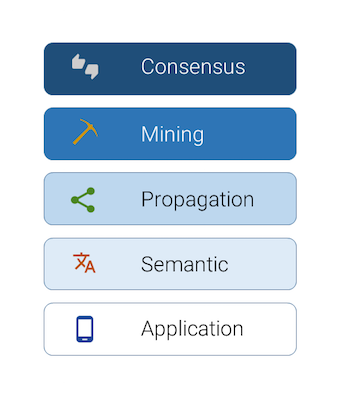 We argue that mining coins (the cryptocurrency used at the mining layer) should be usable only at the mining layer, and even more stringently they should only support two operations: creation and consumption. 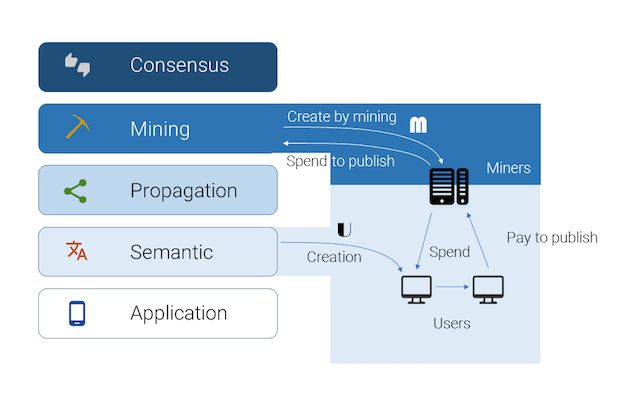 In addition, consuming a mining coin doesn’t mean transferring it from the publisher to the miner, consuming a mining coin means attaching it to a block andretiring the coin when that block is confirmed, sending it back into the void where it came from. Excellent description of the nitty-gritty of the DAO hack over here on Peter Vessenes’ blog. I wanted to jump on this opportunity to point out that another reason this hack was possible was because the creators of the DAO contract were using the wrong paradigm for thinking about money. We shouldn’t blame them for this particular mistake (they have much more grave mistakes to answer for) because it’s the paradigm we all use, but that doesn’t make it any less wrong, and understanding the problem may help guide future development. When you think of money, what’s the first thing that comes to mind? For anyone born before the 21st century, it’s probably coins and bills, which is the first kind of money that most people are exposed to. The fact that these are physical tokens colors the way we think about money from our childhood onwards, and leads to the belief that money is the fundamental unit of finance. But this is not true! The fundamental unit of finance is not money, but the exchange of money. Our human brains are much more adept at thinking about nouns than about verbs, so we’ve focused our attention on the technology that records the exchange of money rather than the underlying exchange itself. But think about it, coins and bills (and to go back further, gold and seashells) are no more than a technology that helps us keep track of the past history of economic transactions. Their primary advantage is that they’re not easily counterfeited, so when someone hands us a wad of cash we believe that there was a history of economic transactions that led that person to earn that wad of cash. Returning to the incorrect paradigm, as humans with our proclivity to focus on nouns, we think much more readily about account balances, the digital analogue of tokens, than we think about histories of transactions. But an account balance is nothing more than a summary of a history of transactions, and so an account balance is just the output of running a function on a history of transactions. This function seems simple: subtract outgoing transfers and add incoming ones. If we had a ledger that didn’t change this would be fine. 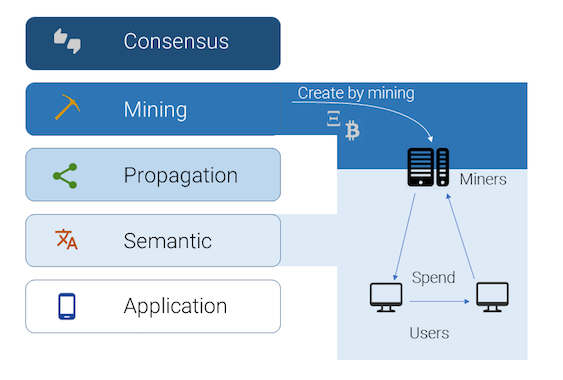 But this ignores the dynamic nature of ledgers, where new transactions are constantly being added and those transactions require some integrity guarantee (e.g. no new transaction should be added that makes the net total transfer go negative) and violating transactions should be rejected. How did this lead to the DAO hack? I’ll again defer to this excellent recap of the hack for the details, but I’ll try to summarize the hack using the above perspective on account balances vs. transaction histories. The DAO contract checks whether certain transactions are legal by comparing them to a stored record of account balances (red flag!). If the transaction does not cause the account balance to go negative, then the transaction is permitted. After the transaction is created the account balance is updated to reflect the outgoing transfer. The hacker was able to exploit two bugs where the transaction history and account balance fell out of sync. The first bug is subtle: the code allowed for a recursive call where two or more transactions are recursively created. Both transactions attempt to move out the attacker’s entire balance out of the DAO. When it succeeds, the inner transaction deducts the attacker’s previous balance from the DAO’s balance and sets the attacker’s remaining funds balance to zero. The outer transaction also completes, and deducts the attacker’s previous balance from the DAO’s balance. But the attacker’s previous balance was just updated to zero by the inner transaction! So after the outer transaction completes the DAO has not only transferred twice the amount it should have to the attacker, it also thinks it has more funds than it actually does. The first and most radical suggestion is that developers stop using account balances in their code. Instead, checking whether or not a transaction is valid (e.g. there is enough Ether to transfer out) should always be done by looking at the history of transactions and recomputing the net total transfer into/out of an account. This is admittedly computationally expensive, and in a resource-constrained environment like the EVM may be a non-starter. Nevertheless perhaps this philosophy can help guide future development of the EVM or successor technologies. This error would also have been prevented if transaction creation and account balance update were atomic: both succeed or fail together and at the same time. This is a basic standard notion in applications like databases and surprisingly absent from the Ethereum spec, given the importance of data integrity in financial settings. In this particular case, wrapping everything in a transaction would have resulted in a final commit that tried to create multiple transactions and deduct the total amount of all the requested transactions from the account balance, which would have been rejected since the account did not have a sufficient balance. I see no reason why the EVM couldn’t be modified to support such functionality. Maybe it’s even possible to support this functionality at a higher level without modifying the EVM spec. The protection it provides is orthogonal to some of the other tools that people are proposing (strong type safety, formal verification, etc.) so they should all be pursued, but I would guess that this is both simpler and more user-friendly since most people with some dev experience have used a database commit/rollback before. Update: Thanks to edmundedgar on the reddit channel for helping me see that the above suggestion about commit/rollback isn’t really appropriate, since the EVM execution environment is single-threaded. The problem is not contesting threads, its re-entrant calls on a single thread. I think a related solution would still help though: create a standard library for managing transfers of balances (could be both for tokens or Ether). An example transfer function might do the following: keep track of a “transfer active” flag per account, and when a transfer into/out of an account is attempted, first check the flag. If it’s on then throw an error, otherwise perform the transfer, update the account balance, and clear the flag. In this case, if the receiving contract attempts a re-entrant call, the flag will be on and an error will be thrown, thwarting the attack. I’ve avoided using the word “database transaction” (which is what this kind of commit/rollback mechanism is doing) since the word transaction is overloaded here. Any suggestions on how to refer to this idea without using the word transaction? I also think it’d be nice if we had a simple and precise word to capture the notion of “exchange of money”. I don’t have the best words, but someone who has better words may be able to come up with a fitting and memorable term that we can use to help put the exchange of money at the center of our thinking about financial transactions rather than the money itself. The Ethereum DAO hack has rocked the Blockchain world in the last few days, calling into question the security of Ethereum (the #2 Blockchain technology after Bitcoin) and with it the notion of smart contracts in general. Technical details of the hack can be gleaned here and for some background you can check out the very (too?) slick DAO website here. In short, the DAO was the most hyped application of Ethereum (which is still in beta, mind you) and which garnered ~$150 million worth in Ether in funding, and was touted to be the first example of a distributed organization governed by code rather than people. It got tons of press and that exposure makes this failure all the more embarrassing. The hack exploits a bug in the code of the DAO and has allowed the attacker to drain $50 million worth of Ether (Ethereum’s base currency) from the DAO. It’s worthwhile to note that the hack affects the DAO but not the underlying Ethereum Blockchain, which remains secure as far as we know. Instead of dwelling on the DAO’s failure and the possibility of a fork to save the lost ether (lots of chatter and Schadenfreude on reddit on the topic right now), I’d like to take the opportunity to focus on some lessons we might learn and suggestions for moving forward. The idea of smart contracts sounds extremely appealing: contracts that trigger actions on their own when predetermined conditions are met and whose terms are as hard and concrete as computer code and published to the Blockchain for all the world to see. No more hiring expensive lawyers to debate what that comma means, no more getting papercuts flipping through 5 inches of riders and addenda, no more yelling on the phone arguing about whether or not certain criteria were met. This is a romantic notion that appeals particularly to computer scientists, for we see the world through our computational lens and are inclined to view laws and contracts as nothing but programs written in fluffy natural language. Stripping away the fluff and crystallizing the underlying intent in code, removing all ambiguity, seems like the natural next step. In reality, the fact is that crystallizing the intent of contracts and laws into code is extremely difficult. Even moderately complex contracts are difficult to formalize and that complexity opens the door to misimplementation. One approach to dealing with this is by flipping the picture on its head: we can hold the code to be the contract, and hold that there are no guarantees except what the code provides for. This was the position of the people who created the DAO, at least before it was attacked. But that is a sandy foundation for a financial network: if we really believed that, then there has been no exploit, the DAO is functioning as it was intended to, and we should pat the lucky chap who now has $50 million extra worth of ether on his back. How many people could you convince to use a network with that philosophy? Beyond malicious hacks, this position also means that contracts cannot be patched when bugs are discovered. After all, maybe the reason that I accepted a contract in the first place was because I had spotted a bug and intended to use it to my advantage. By patching the contract you’re changing our original agreement. It seems therefore that we must separate the implementation of a contract as represented by code from the abstract content or meaning of the contract, and that the former can and should be adjusted to reflect the latter if any significant discrepancy arises. Of course, the content/meaning of a contract is often not totally well-defined, which means we’re not completely escaping the world of natural language and human ambiguity. This seems unavoidable (especially given the next point about dealing with the real world), but even with this caveat smart contracts via the Blockchain retain some advantage: automatic execution, public auditability, and improved (if not always complete) precision. A much more important problem is the fact that contracts live in an extremely complex and uncertain environment: the real world. If you’re a programmer, you know that writing programs for complex environments is much harder because the number of things that can go wrong grows dramatically. While we know we’re supposed to think about all the corner cases and figure out all the contingencies, the fact is that even in a relatively well-understood environment like a computer network we often forget or fail to add in all the error checking and handling that’s needed to make a system truly robust. Now compare that with the chaotic mess that is the real world, where unexpected things happen regularly that you couldn’t hope to have accounted for in your contract: a hurricane might wipe out swaths of New York City, ISIS might attack Turkey, someone might discover the cure to AIDS, and so on. Crazy events happen and there will undoubtedly arise events that a codified contract was not intended to handle. This will lead to disputes about whether the contract is performing according to its original intent, and we quickly fall back into a world where everyone is calling their lawyer. With the above observations, one proposal I’d like to make is that we institutionalize the idea of a contract steward and make it recommended or even mandatory for all but the simplest smart contracts. The steward’s responsibility is to intervene in the event of a bug being discovered or if an event arises that’s not covered by the original code of the smart contract. The actions that a steward can take may be restricted by the original smart contract (e.g. an expiration date after which the contract state is immutable even by the steward), but should be rather broad in order to be able to handle as large a range of contingencies as possible. One key question is who should play the role of steward? This can and should be decided on a contract-by-contract basis. The creators of the contract can designate a steward that they all trust, whether it be a friend, a court, or a company set up for such purposes, similar to an escrow service. We see that this is already happening in an ad hoc way in the DAO debacle: the Ethereum developers are proposing a fork precisely to prevent the ill-gotten ether from being spent, and are thus playing the role of steward in this crisis. While the Ethereum devs may be the natural party to appeal to in this case because of their prominence, it’s not really clear if they’re neutral (some are invested in the DAO) or suffer from other conflicts of interest. If we could institutionalize a neutral 3rd party steward in contracts, we would have a systematic response to hacks and bugs and more importantlywe may dissuade attackers from exploiting bugs because they know that their attack can be reversed. Finally, this change is “easy to implement” in the sense that it does not require any technical changes to Ethereum itself. Rather, it requires only that new contracts be written to designate a steward and grant them the ability to intervene. Some will cry that this is antithetical to the spirit of the Blockchain, and truly it is, if one insists that the Blockchain is about total and non-negotiable decentralization. But it seems like sacrificing this bit of ideological purity is worth it to escape the grip of immutable buggy contracts, which if allowed to persist will kill the appeal of smart contracts altogether. Copyright © 2019 the random oracle.